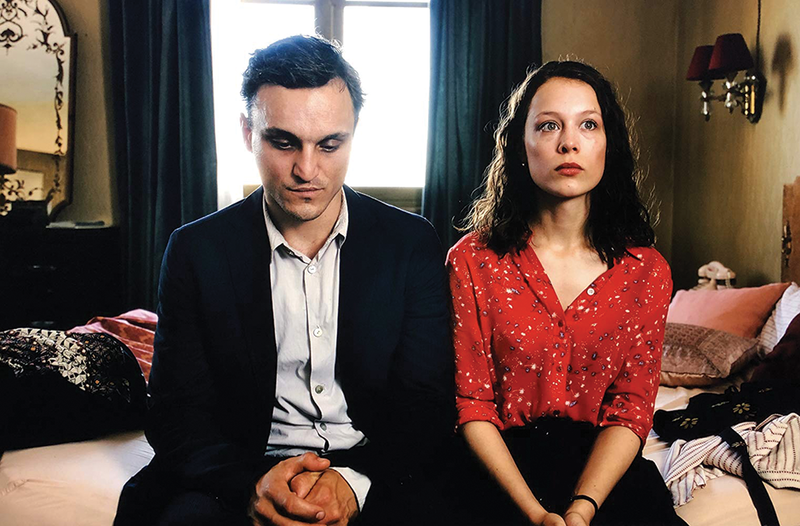 Christian Petzold's Transit opens with Georg (Franz Rogowski) sitting in a café, sirens howling on the streets outside. Paris is bracing for an impending occupation by Germany—and the accompanying threat to anyone deemed a subversive—but it's hard to tell exactly when this story is set. Is it 1940s France, tracking the World War II setting of the Anna Seghers' source-material novel, with 20th-century technology like manual typewriters? Or is it the present day, as suggested by cars, graffiti and music of a more modern vintage—and nary a reference to Nazis? That uncertainty is a significant part of the subtext of Transit, though the narrative follows a fairly straightforward path. At risk of arrest because of his association with leftist writers, Georg flees Paris for Marseilles with an injured colleague who dies along the way. He's in possession of documents intended for a writer named Weidel, who has committed suicide, that offer Weidel the possibility of safe passage to Mexico. Upon his arrival in Marseilles, Georg inadvertently finds himself with the opportunity to take advantage of these documents to secure transit out of France by adopting Weidel's identity, even as he befriends Driss (Lilien Batman), the young son of his dead friend. His relationship with Driss is just one of the interactions that present Georg with a moral choice beyond prioritizing his own safety. Eventually he encounters Marie (Paula Beer), Weidel's estranged wife, who finds herself pulled back and forth between her own opportunities to flee France and her desire to wait and trust Weidel's professed intent to return to her. While Petzold could have built the entire narrative around the deception in Georg's relationship with Marie—with whom he begins to fall in love, even as he can't tell her that her husband is already dead, lest he blow his own cover—he doesn't lean into the potentially tragic romance, or the "when will she find out" plot point. She might be one of the people Georg has to mislead or leave behind to save his own skin, but she's not the only one. The anchor for these interactions is Rogowski, who offers a deeply internalized character straddling the rapidly closing border between hero and anti-hero. With piercing eyes and a dead-ringer resemblance to Joaquin Phoenix, Rogowski brings a coiled intensity to a character who spends much of the film waiting—waiting in lines at government offices, waiting for the scheduled departure of the boat on which he has secured passage, waiting for someone to open a door. Scene after scene depends on the sense that Georg is wrestling with whose needs he's willing to prioritize and whose unhappiness he's willing to cause. As much as it's a story of Georg's moral choices, however, it's also a fairly brilliant study of people's lives held in the hands of bureaucracy. As Georg makes his way to various consulates to get the documents he requires, he finds himself spotting familiar faces in each subsequent room full of queueing people, all desperate for the papers that can get them to a safe, secure place. Key moments in Transit repeatedly revolve around who has the power to provide the keys to that security and how easily it can be thwarted by the capricious decisions of someone with more power, a sharp metaphor for the way so much of the world—including our own country—deals with refugees. The message perhaps doesn't require the underlining that occurs when Georg relates one of Weidel's allegorical stories about the nature of hell, but Transit always understands how much suffering is caused by people choosing to do nothing. Transit ends with Georg sitting in a café, sirens howling on the streets outside. It's a pointed bookend to the opening scene, tying together a story that is about both the horrors of a bygone time and the horrors so many people face right now. It doesn't take much to recognize that our current political moment feels a lot like 1940s Europe. You can run from it, the way Georg tries to, but even if you make the right choices, that doesn't mean you won't find yourself in exactly the same place over and over again.